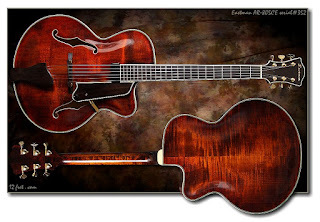 As many of you readers begin to dig deeper into learning jazz guitar harmony and voicings, you'll undoubtedly come across various 9th chords, Maj9, m9, 9 etc., in your jazz-guitar explorations. Since these chords pop up time and again, it is important to have a variety of 9th chords under your fingers so that you can bring them into your comping, chord melody and chord soloing ideas when needed. But this doesn’t mean you have to learn a bunch of new chords. You can use previous knowledge to build great-sounding and authentic jazzy 9th chords. In today’s lesson, we’ll be looking at how you can use “rootless” 9th chords to expand your jazz-guitar chord vocabulary without having to learn any new shapes, simply adapting four-note chords you already have under your fingers to a new musical situation. To begin, let’s take a look at four common jazz chords with their 1357 and rootless 9th-chord voicings. Notice that each chord pair shares three notes in common: the 3-5-7 of each chord, but that in the second voicing the 9th has replaced the root, which is why we call them “rootless” 9th chords, as they contain no root in the voicing. 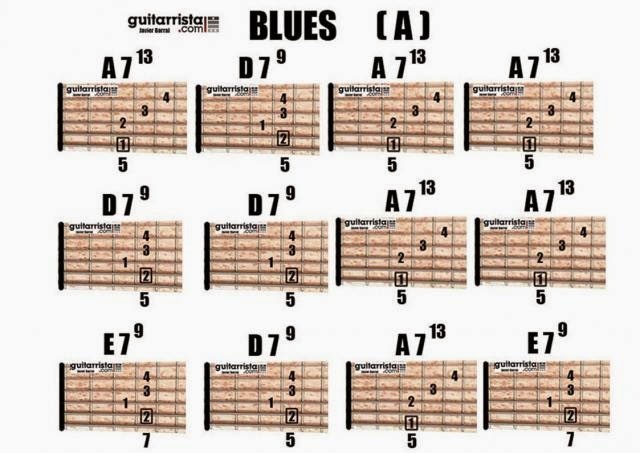 To get you started, here's a quick reference for the four chords used below. This means that if you see a Dm7 and you want to make it Dm9, you simply play Fmaj7, a Maj7 chord starting on the 3rd of Dm7. 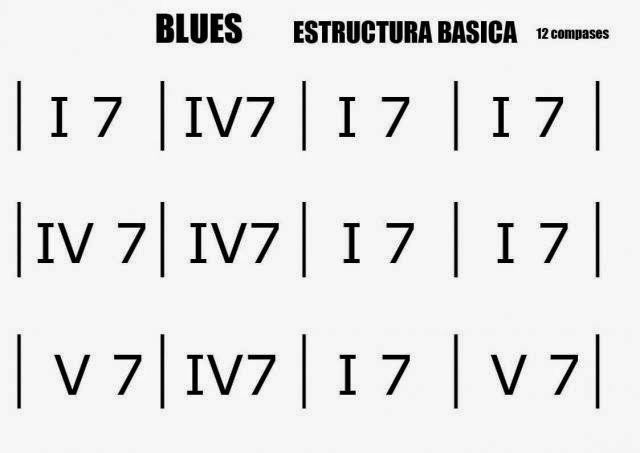 Try this out with each of the following chords, Maj7-7-m7-mMaj7, using the quick guide above as a reference, through all 12 keys and with as many voicings for each 9th as you can come up with. Here are two examples of how you can apply rootless 9th chords to a Major Key ii V I progression, one using Drop 2 and one using Drop 3 chord voicings. As a quick reference, here are the three normal chords, 1357, next to the related rootless 9th chords. If you can memorize these formulas, you will be able to quickly and easily use these chords in any jam or gig you’re on. Try these chords out in all 12 keys, both all Drop 2 and Drop 3, then come up with your own rootless 9th chords and bring them into your Major ii V I progressions as you explore this concept further in the woodshed. To help get you started in the minor-key area, here is an example of a minor ii-V-I chord progression using both Drop 2 and Drop 3 rootless 9th chords. For the m7b5, we don’t normally include a 9th with that voicing, and so you will notice that I used a plain, 1357 chord in those instances. For the other two chords, G7b9 and CmMaj7, I used a Bdim7 over G7b9, producing a rootless 7b9 chord, and an Ebmaj7#5 over CmMaj7, producing a rootless mMaj9 chord. Check out the example below, taking it to all 12 keys if possible, and then build your own 9th voicings for minor ii V I progressions using the rules given above. After you have checked out the different examples above, here are a number of ways that you can explore 9th chords further in your jazz guitar practicing schedule. 01. Play any/all of the above examples in all 12 keys at various tempos. 02. Play the rootless 9th chord for any voicing you are working on and sing the root below the chord. 03. Take a tune you are working on and learn all of the chords as rootless 9th voicings, using the above lesson as a guide to find each 9th chord in the tune. 04. Practice any 9th chord that you learn with a number of different jazz guitar chords such as Drop 2 Chords, Drop 3 Chords and Drop 2 and 4 Chords. 05. 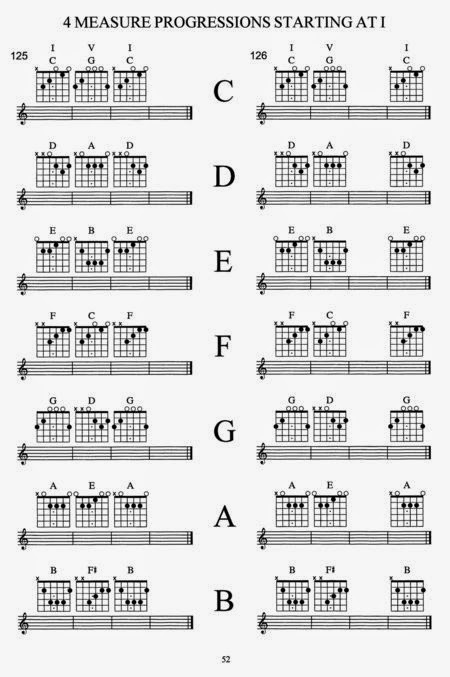 Practice arpeggiating each of the rootless 9th chords in the above examples and begin to bring this concept into your soloing ideas as well. 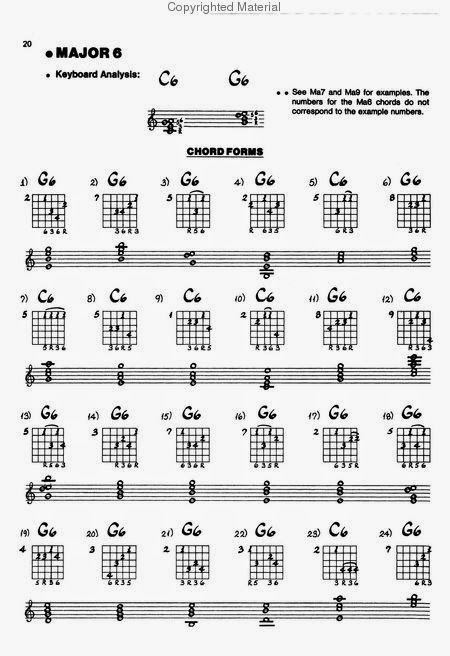 Playing 9th chords, and especially rootless 9ths, is an important skill for any jazz guitarist to have under their fingers. 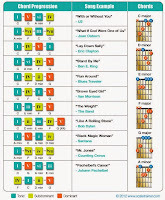 Check out the above examples and exercises to get started in your exploration of these handy and cool-sounding jazz guitar chords. If you have any questions about these chords, or anything jazz-guitar related, feel free to post it in the COMMENTS section below. "Con esta aplicación tienen la posibilidad de practicar progresiones de acordes con armonías de diversas complejidades y armar las que cada uno quiera"
The number of ways chords can go together to produce new and interesting sounds is nearly infinite. Musicians use their intuition and experience to arrange chords in ways that move the music along. This notion of movement is important to understanding how to compose and improvise a piece of music. Chord progressions are what gives a piece of music its harmonic movement. Usually the interplay between chords in a piece of music creates the feeling of movement and change. Some chord combinations sound uplifting, others sound somber, and some sound like ocean waves. While these harmonies and how we interpret them are nearly endless, there is a very simple principle at work. Most pieces of music tend to first establish a feeling of stability, depart from it, create tension, then return to the feeling of stability. Though some pieces of music demonstrate this more dramatically than others, as you train your ear you will become increasingly aware of it. The way chords are placed one after the other in a piece of music is called a chord progression. The chords in a progression have different harmonic functions. Some chords provide the stability, some the departure, and some provide the dynamic tension. Roman numerals are used to indicate the chords in a progression. The numerals are based on the scale pattern of the diatonic scale. 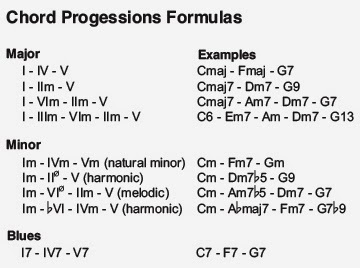 For example, in the key of C major a I, IV, V7 (one, four, five) progression indicates the chords Cmaj, Fmaj, and Gdom7. In the key of F these chords would be Fmaj, Bbmaj, and Cdom7. 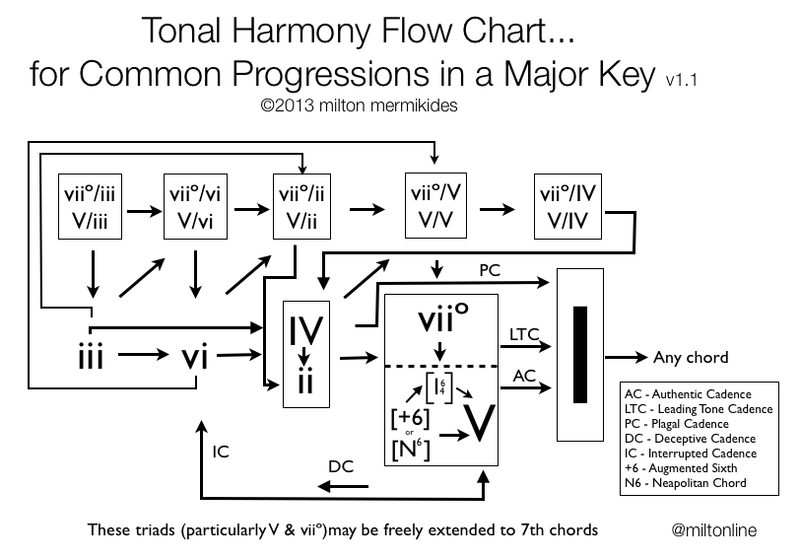 The diagram below shows the formulas of the more common chord progressions in major and minor keys. The Roman numerals in a chord progression formula signify the triad form of the chord. It is harmonically permissible to extend these chords with additional diatonic tones to create different chords. In other words, you can add notes to these chords as long as the notes are part of the diatonic scale. The harmonic function of the chord does not change. The Roman numerals refer to the position of each chord in the diatonic scale. 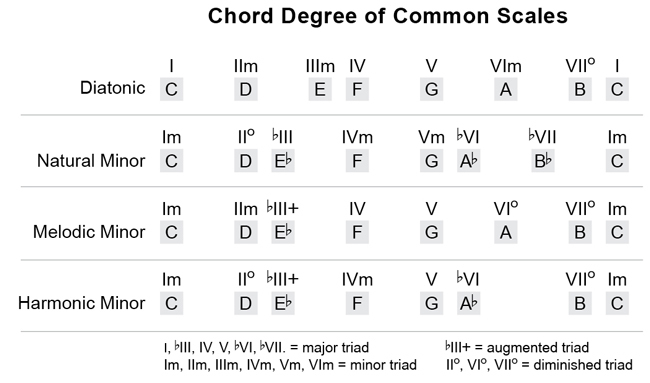 The diagram below shows how the Roman numeral scale degree can be interpreted with different chords. All of the examples below can be interpreted from the same chord formula. Chord formulas are written in Roman numerals to represent the generic form of the progression. Often musicians will learn a piece of music by its chord progression formula. One reason for this is that it is easier to remember since many songs are based on the same formula. Another reason is, it is easier to play a song in different keys if you know the formula. 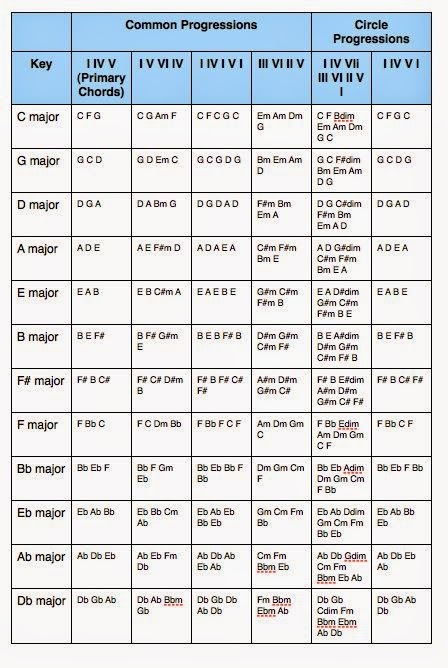 However, this assumes you know which chords make up which keys. Singer: "Hey, I've got this new song I want to do. It's basically a six-two-five progression." Pianist: "What key do you like?" Singer: "I don't know. Maybe Bb." You can see if you are the pianist you need to be ready to play the same progression in several keys. The chords indicated by the Roman numerals also have names. For instance, the first chord of the scale is the tonic. The fifth chord is the dominant. 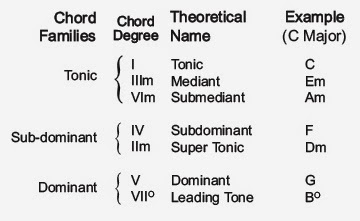 The diagram below shows the functional names and scale degree of the diatonic scale. Beneath this are notes from several common keys that match the function and degree. 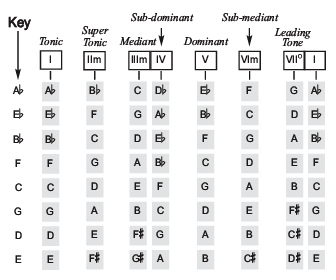 Other scales whose scale patterns differ from the diatonic scale are assigned chord degrees according to the sharpness or flatness of their notes. That is, the diatonic scale creates a "ruler" that other scales are measured against. That is why the resulting chord based on the third note of the C natural minor scale is bIIIm (Ebm) and not III as in the diatonic scale. The chart below shows how different scales compare. Because the notes of the scales are spaced differently they produce different chords. To add variety to the movement you can substitute chords, play dominant chords in place of minor chords, and vise versa. Play diminished chords instead of a dominant. Play chords with extensions. In other words, explore the different ways you can link chords together to create harmonic movement. Example: One of the most common progressions in music is the I, IV, V (one, four, five) and say we want to explore this progression in the key of C major. Since we are in the key of C Major our tonic chord will be a major chord with C as its root. 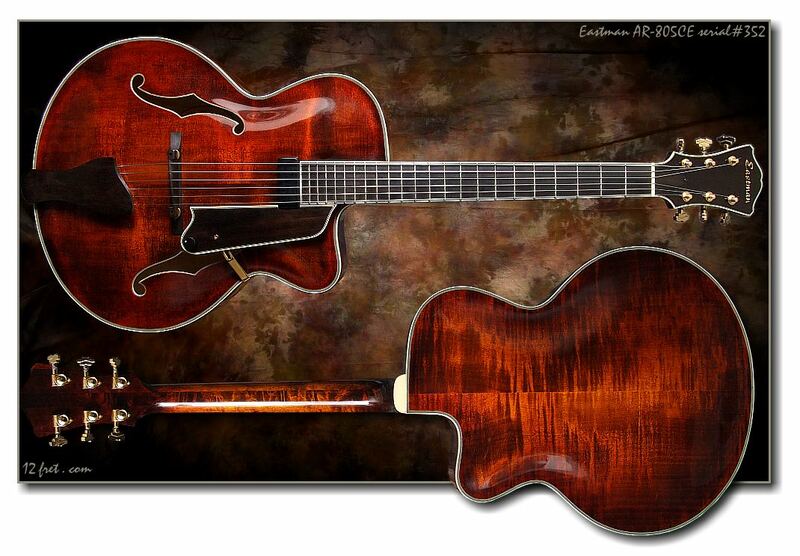 There are several chords we could choose but for this example let's pick Cmaj7. Next, we've got the IV (the four chord). It's also a major chord but since it is derived from the fourth degree of the C Major scale its root must be F. Normally we might choose Fmaj7 but let's bend the rules and experiment. Let's make this an Fm7b5 chord (F,Ab,B, Eb). F7 has an Eb and an Ab, neither which belong to the key of C Major. However, most importantly we are changing the major chord into a minor. That creates a completely different sound. That's where we are bending the rules. However, the most basic rule in music theory is that if it sounds okay, it's allowed. The V chord can act as a stronger dominant chord if we add the 7th note of the Mixolydian mode. In this case we produce a Gdom7 (G, B, D, F). Now we have a I, IV7, V7 progression. We can spice up this progression even more. The V (five chord) is the chord that expresses the most tension in a progression and if we want to add more tension we can alter the chord. This means we can add notes that don't belong to the key which almost always produces a dissonant harmony that creates tension. So, if we sharp the fifth and the ninth degree of the G7 chord we end up with G7#5#9 (G, B, Eb, Bb). Our final formula is: Imaj7, IVm7b5, V7#5#9. Notice how this sounds compares to the original I, IV, V.
There are more substitutions that can be made. This is just the beginning. Experiment and explore to create different harmonic movements. Let your ear decide what's right and not right. 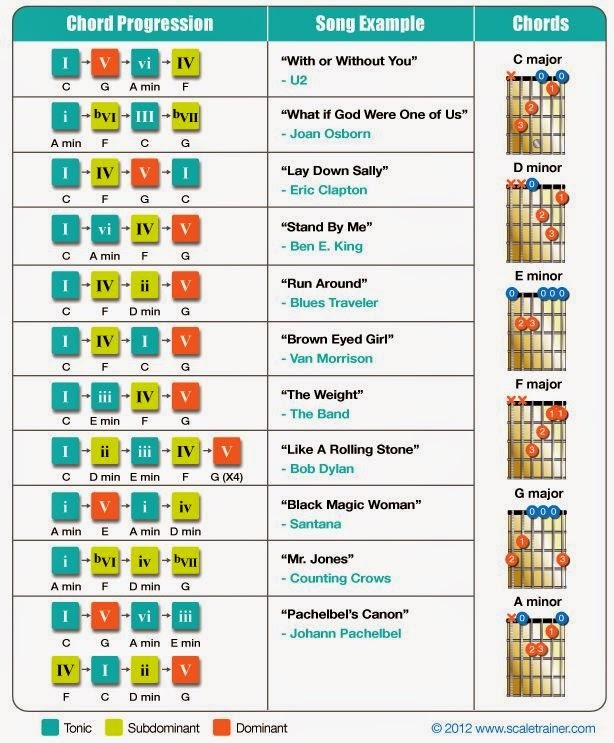 This is a chart of the chord symbols and their meaning.